Some restaurants feel like home. Poesia gives just that feel as you walk up into the second story restaurant, which could pass for a San Francisco residence or inn. Set in a relatively quiet pocket of the Castro neighborhood, the mostly Southern Italian restaurant is nestled between residential homes, neighborhood bars and interesting shops (chaps, anyone?) on 18th Street. The charm builds as you step into the warm, butter-hued space that seats nearly 40. 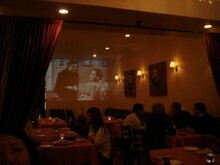 A full bar lines one side of the dining room while the adjacent wall projects old Italian films, giving a Fellini-esque quality. A small corner behind the bar is considered the poetry lounge, furnished with antique seating meant for browsing the collection of old poems while you wait for a table. However, it’s easily forgettable, hidden somewhat behind the bar. The front dining area is much more where you’d want to be. Hitting its one year anniversary, Poesia is owned by first-time restaurateur Francesco D’Ippolito of Calabria; he strives for authentic southern fare from an authentic Italian staff. On a mid-week evening, we strolled into a half-empty dining room (which felt the more romantic for it, as opposed to other restaurants where you start wondering why there aren’t more guests). Other reviews have noted evenings abuzz with large parties and couples alike. The space works for both. The menu is not overwhelmed by too many selections. It is just right, with a few careful selections in each category -- antipasti, salads and soups, pasta, mains, and specials. The menu also changes frequently. We were sad to have missed the arancini which yelpers and sfgate have gushed about. But we were delighted with the appetizer special on our visit -- a salad of perfectly grilled squid ($ 14) tossed with cherry tomato halves and arugula, finished with a light vinaigrette and a squeeze of lemon – simple and perfect. The fried artichoke ($12) wasn’t anywhere near as satisfying. 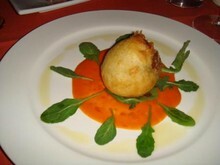 While the presentation is interesting – a fried puff on a bed of orange tomato sauce resembling a blazing sun, the flavors and texture were unsatisfying. The fried layer bordered on soggy, and the artichoke filling was a ball of unflavorful mush with very few bites of artichoke chunks. If there was mozzarella in the fried artichoke ball as the menu indicated, it was wasted since it did not accentuate any flavor. We ordered the orechiette with artichokes, provolone and shitake mushrooms ($18) for our pasta course. On the heartier side, the rich sauce would have paired better with a thicker pasta to absorb the wonderful flavor, such as gnocchi. But the sauce deserves credit, presenting a delicious, savory blend of many components including walnuts, peas and a dotting of basil oil that worked. The pastas weigh on the pricier side, all ranging from $18-$22, but they are house-made and the portions are large enough to share. Temperatures on filets and other cuts of beef are telling of a chef’s control over his kitchen, and at some restaurants these steaks can appear on the plate either too bloody or cooked to death. Our filet ($31) emerged from the Poesia kitchen a perfectly grilled medium rare. Giant white runner beans as a pairing were a nice departure from the typical sautéed greens. In the place of classic roast potatoes were potato chips. The eggplant parmigiana ($19) ranked the highest of all the dishes. Triangular layers of eggplant and mozzarella are smothered with a sweet tomato sauce and outlined with a thin drizzle of salsa verde. Flavors and textures are expertly paired in this classic dish. We ordered the cannolo ($10) for a sweet ending. Our pleasant server gave us an Italian lesson when we asked what the difference was between a cannolo and a cannoli. He shook his head and explained that cannolo is singular, whereas cannoli is plural, and cannoli has become the automatic English translation for one or ten. So, as the menu implied, we were correctly served one cannolo…one big fat cannolo. This is one dessert meant to be shared. While flavors in this crispy shell change depending on the night’s menu, ours was filled with ricotta, blackberry and chocolate. Other reviewers are nuts over the chocolate mousse, which we will have to try on the next visit. The wine list is -- like the menu -- approachable, composed of selections from Italy and California and fairly priced. Most hover around the high $20’s to mid $40’s. 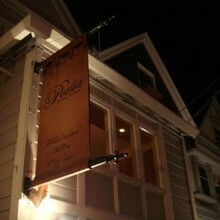 Poesia feels familiar, as if we had stumbled into a gem somewhere in Calabria right here in San Francisco. And like a favorite poem, we will come back to it again and again.